Would you like to learn how to keep Bees? In past years the High Weald Beekeepers' Association have held informal meetings to explain all about what's involved in keeping bees. This is a new venture for the High Weald Bee Keepers' Association, comprising in a short day an introduction to bees, their biology and beekeeping, including opening a hive to meet the girls. Lunch is included. An ideal present for someone you feel may be interested in bees or the man / woman who has everything. Our BEGINNERS BEEKEEPING COURSE runs for 8 Saturday afternoons throughout the season, from early March to early September. The course aims to provide you with enough knowledge, experience and confidence to enable you to keep your own bees. The course is made up of two distinct parts - the Beginners' Introduction course comprising 3 sessions and the Beginners' Main Course comprising a further 5 sessions. This is a more in-depth initiation into the world of beekeeping compared to the Taster Day to help you determine if beekeeping is really for you. Beekeeping although fun and fascinating is also a serious undertaking that should be approached responsibly, much in the same way as taking on any other livestock or pets. The Beginners' Introduction Course then leads straight into the Beginners' Main Course should you wish to continue further. The Beginner's Main Course continues on from the Beginners' Introduction Course and participants are expected to have attended the Introduction Course. 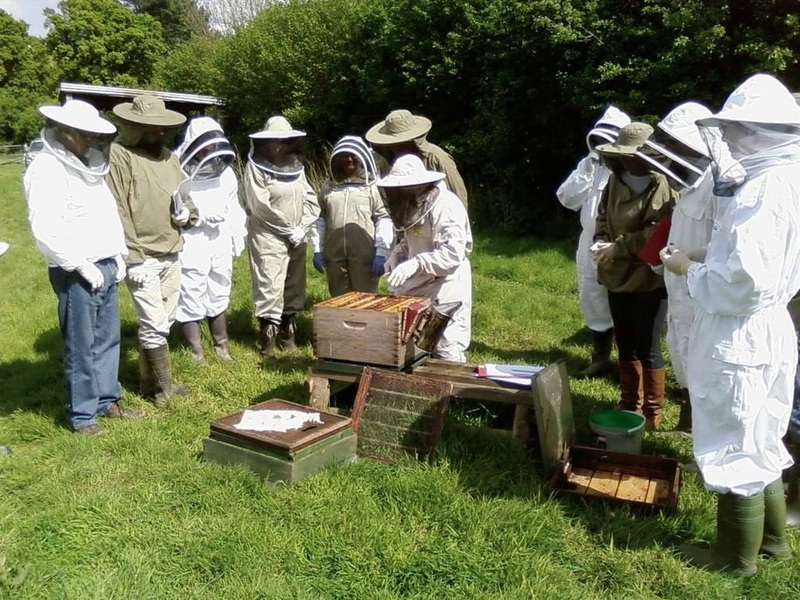 The course comprises a further 5 sessions most of which are held at the Association training apiary. One or more sessions may involve going on a Bee Safari (visiting a number of the beginners' apiaries) or visiting another member's apiary for variety. It is necessary to register for these courses on this site (click here for a link). Please email our Training Officer if you have any questions. New Members are also encouraged to attend our regular monthly Bee Banter meetings where you will also learn a great deal by listening, looking, and asking questions. For Members who already have bees, we provide ongoing support via various activities such as BeeBanter Meetings, Apiary Meetings and our regular Topical Tips Newletter. is a new venture we are hoping to encourage in future.